Height: 5 feet as a frog, 5'8" as a human. 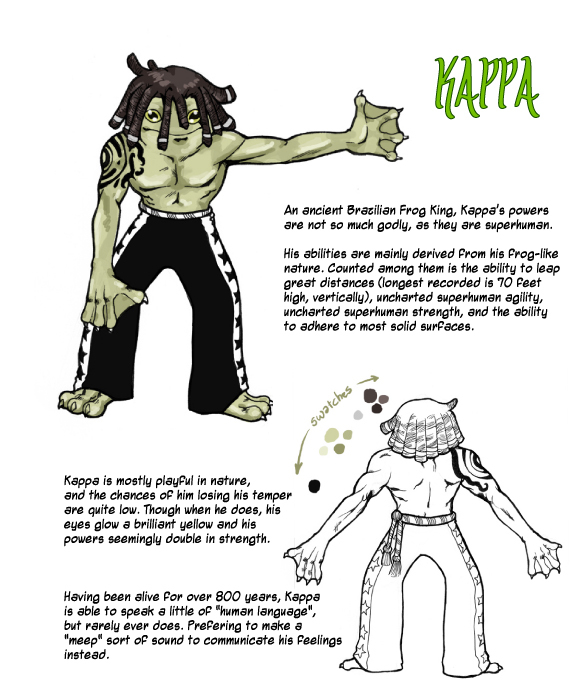 Most recently, kappa gained the ability to switch between human and frog form. While in human form, he does not have any of the abilities his frog form contains. While in his frog form, his thought patterns become erratic and aggressive if the form is kept too long (usually after 5 minutes). While in frog form he has above-human strength, uncharted superhuman agility, ability to adhere to walls and legs powerful enough to hurl him 70 feet high, Vertically when in frog form. 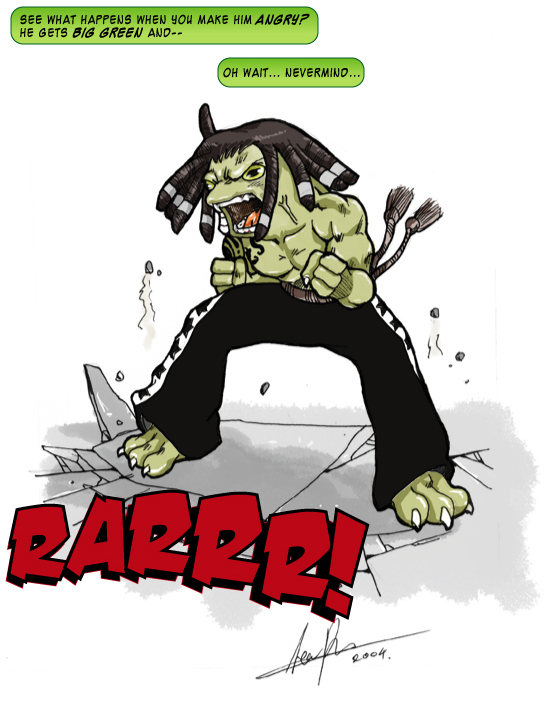 Capoeira, and whatever else is handy. Kappa was born and lived on an island off Brazil. As the only humanoid frog on the island, he decided to take it upon himself to become king of said island. One day, his island was devoured by a gigantic goldfish, much to kappa's suprise. With no other choice, Kappa moved to Void city. After being denied permanent residency due to "being a frog", kappa was forced into a cold and harsh existance as a hobo on the streets of void *sniff*. Several months later, kappa vanished shortly after his human counterpart from another dimension made an appearance in void. Upon returning, Kappa was no longer the same carefree, simple-minded frog he once was. Something had changed.